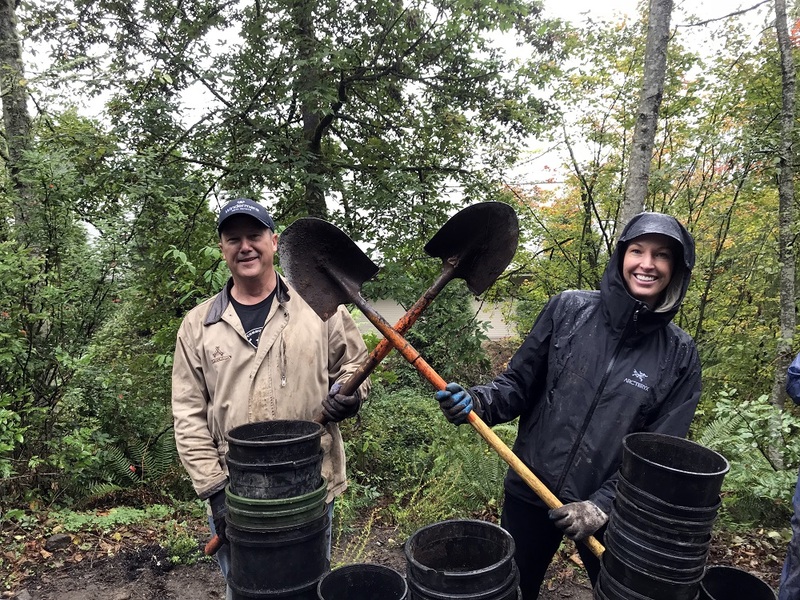 A little rain didn’t stop a group of 25 REALTORS®, Affiliates and friends from gathering Friday to get their hands dirty and give back to the community. 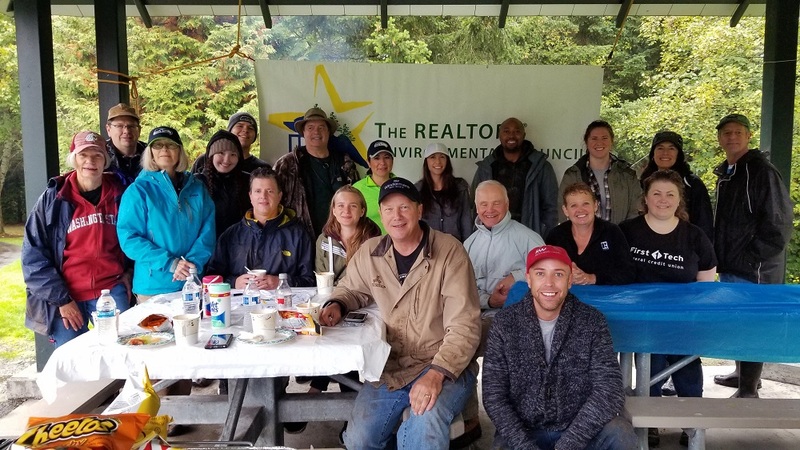 The 12th annual The REALTORS® Environmental Council (TREC) planting event brought the group to Lakemont Community Park in Bellevue for a full morning of giving 500 plants a permanent home. Volunteers worked under the supervision of Bellevue Parks employees Elliott Church and Mark Sharrett Master Naturalist Volunteer Dave Clemens to plant a wide variety of native trees and shrubs, including Douglas fir, Cascara, Western red cedar, Indian plum, snowberry, salmonberry, Pacific ninebark, low Oregon grape, red-flowering currant, evergreen huckleberry, and red huckleberry. 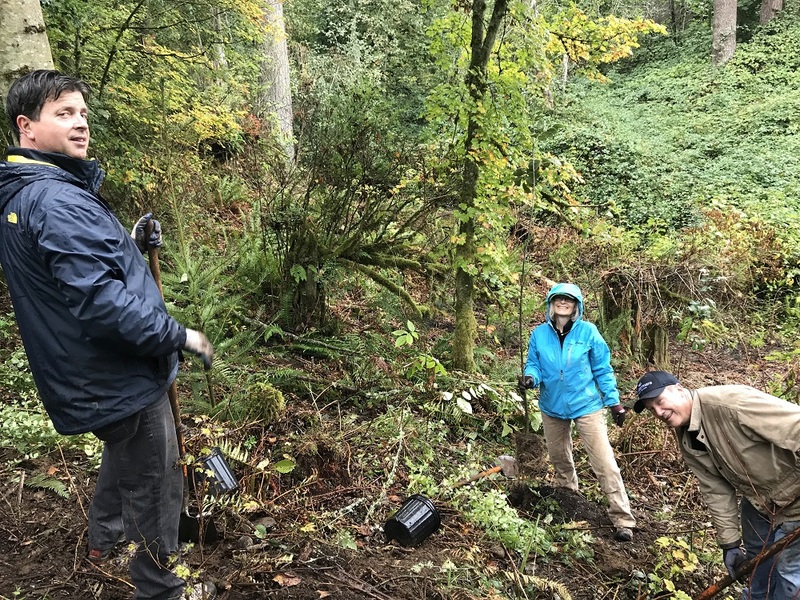 These species were chosen as part of an effort to restore native plants to the area, which was heavily logged without proper replenishment of the trees and shrubs that belong there. The hillside where the REALTORS® worked was also recently reclaimed from an infestation of non-native blackberry plants. 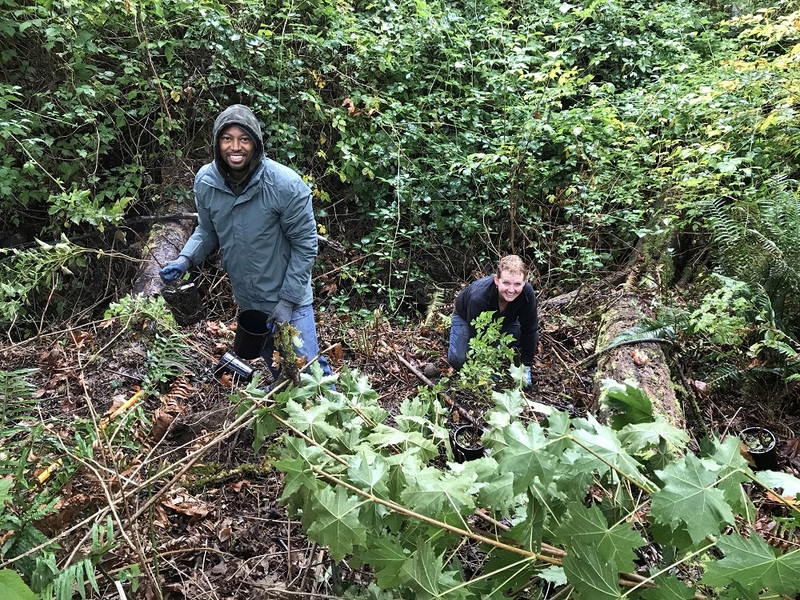 City of Bellevue Park Ranger & Environmental Programs Coordinator Curtis Kukal thanked the group for their willingness to participate on a rainy October day instead of more popular volunteer times like Earth Day or over the summer. “October through December is one of the best times to put plants in the ground, but we can’t always find volunteers to help,” he said. Friday’s planting was part of the “Eco Fridays” events hosted by Bellevue Parks & Community Services. 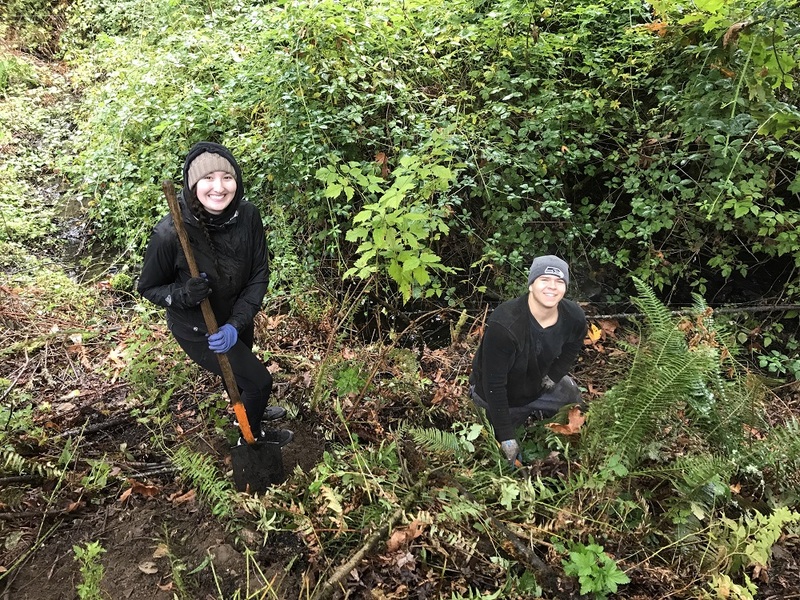 The events, which are open to the public, are unique opportunities for businesses to participate in the stewardship and care of Bellevue’s Park and Open Space System. David Crowell, SKCR’s director of governmental and public affairs, said the goal in forming TREC was to bring together REALTORS® and the community to help preserve healthy, natural habitats. “We believe public parks offer many recreational, environmental, cultural, social and health benefits and we are committed to supporting efforts to enhance neighborhood assets.” He also noted numerous studies have confirmed the environmental, physical, psychological and economic benefits of parks. Lakemont Community Park spans 16 acres and features a large stormwater management system that reduces flooding and helps protect Lewis Creek and Lake Sammamish from pollution. Along with three miles of multiple-use trails, the park features two picnic shelters, a play area, a softball field, a basketball court, two tennis courts, a skate bowl, and restrooms. SKCR established The REALTORS® Environmental Council as a 501(c)3 nonprofit affiliate to promote environmental stewardship among REALTORS®, its affiliate members and homeowners, and to support projects and policies to preserve a healthy natural habitat. In addition to “on-the-ground” projects to promote green practices, local and national REALTOR® associations offer a Green Designation, a professional credential that signifies proficiency on issues of energy and resource efficiency, along with sustainability in various facets of real estate. 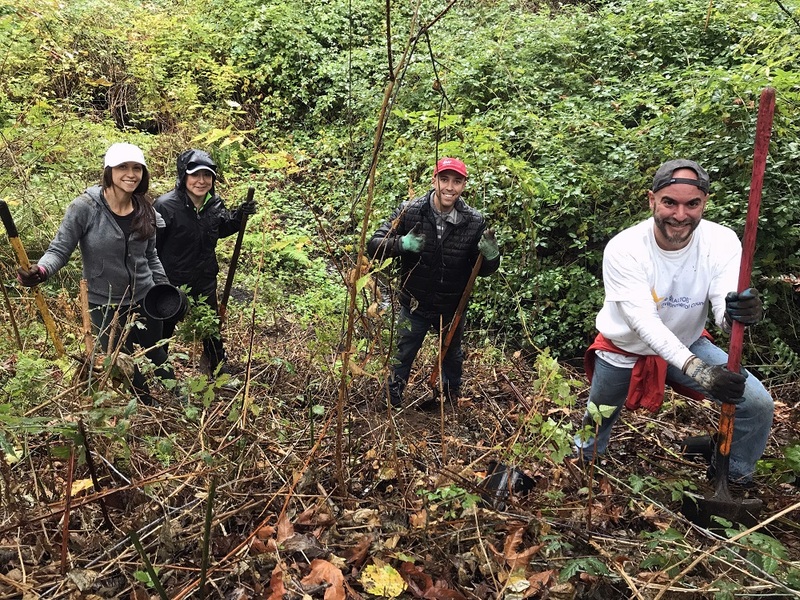 Since inception, TREC volunteers have devoted a day of service at parks and open spaces in Auburn, Bellevue, Federal Way, Issaquah, Kirkland, Renton, Seattle, Shoreline, and Tukwila.